This museum was established in 1926 with the bequest of Francis Edouard Chardon (1865-1925), a bachelor, collector and philanthropist who was born in India and educated in England. His father was a wealthy indigo planter and his mother came from a rich Italian family. She lived the last 10 years of her life in a Llandudno boarding house. Francis, a bachelor (pictured right), studied at the Institute of Fine Art in Naples and specialised in landscapes. 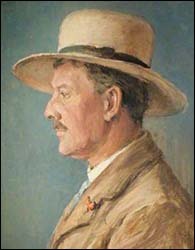 He spent his last few years developing his house in Craig y Don, Llandudno, which he decorated with a collection of fine and decorative art. He bequeathed the house and contents to the people of Llandudno. The museum moved to its current premises in in 1995. The collection has expanded greatly to tell the story of the Llandudno area, from its origins in the Carboniferous period (nearly 350 million years ago) through to its development as the “Queen of Welsh Resorts”. 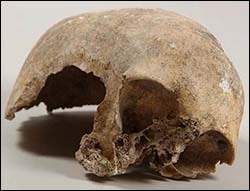 Here you can see prehistoric objects which were found in caves on the Great Orme – they include the 5,000-year-old Pant y Wennol skull (pictured). The museum’s Roman Room contains items excavated in the 1920s at the site of the Roman fort of Canovium, in the Conwy Valley. Other displays relate to St Tudno, the 6th-century saint who gave Llandudno its name, and the town’s contribution to the First and Second World Wars. There’s also a suit of Japanese Samurai armour, which was presented to the Prince of Wales in 1922. Chardon’s art collection is also on display.